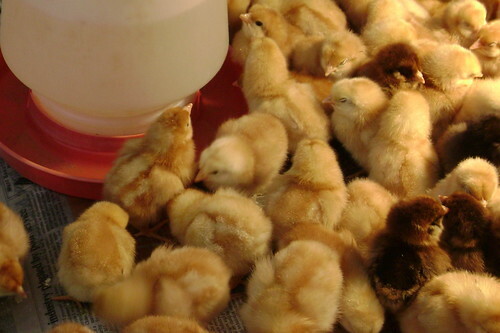 What’s better on Valentine’s Day than fuzzy baby chickens! Snow and ice covered Misty Meadows Farm today, but 228 new baby chickens stayed warm and snug under heat lamps in the “chick house.” The little peeps will begin laying eggs in about 18-20 weeks. So come June we’ll be munching crepes, quiche and French toast made with the colorful assortment of eggs these adorable bits of fluff will produce. The darker chicks are of the Araucana breed, so named for the Indian tribe of Chile where they were first discovered. They will lay an array of Easter-colored eggs ranging from turquoise to deep olive. Their golden cousins the Comets will lay the brown eggs I picture of when I think of farm eggs. I’ve been warned that when we visit the farm late March these babies won’t be nearly as cute. Good thing. I’d squish them due to their sheer cuteness if I could pick them up right now.